Meet the Dog Care Providers - Patrick and Kathryn Heim. Patrick and Kathryn Heim are the sole owners and operators of Rover’s Ranch. They have years of professional experience working with dogs and even more years of simply loving and living with dogs. Patrick and Kathryn each spent the first couple of decades in their professional lives dealing with people in crises: Patrick was a clinical social worker and Kathryn was a litigation paralegal. Ultimately, Patrick and Kathryn's love of animals helped shape their professional and personal choices. Patrick has always shared his life with dogs and other animals. In 2001, Patrick rescued a Border Collie, whom he named Kip. A year later, he rescued an Australian Shepherd, whom he named Kiya. Together, Kip and Kiya developed a friendship at an off-leash park in Seattle with a little Cardigan Corgi named Montag. Not only did Patrick come to love this little dog, but he also fell in love with Montag’s owner, Kathryn, and married her. Patrick started what became a thriving dog-walking/pet-sitting business in Seattle in 2003. This business, Strut Your Mutt, featured off-leash group dog outings, single dog on-leash walks, in-home petsitting, and boarding of dogs at Patrick’s and Kathryn’s home. Some of Patrick’s clients from Strut Your Mutt have remained in touch and continue to bring their dogs across the mountains to Patrick at Rover’s Ranch. Kathryn has shared her life with dogs, cats, and birds since she was four years old. Her Cardigan Corgi, Montag, was Kathryn’s constant companion and joy for 14-1/2 years. Kathryn's love of animals led her to spend several years volunteering at a wildlife rehabilitation center and to groom dogs and cats professionally for almost two years. 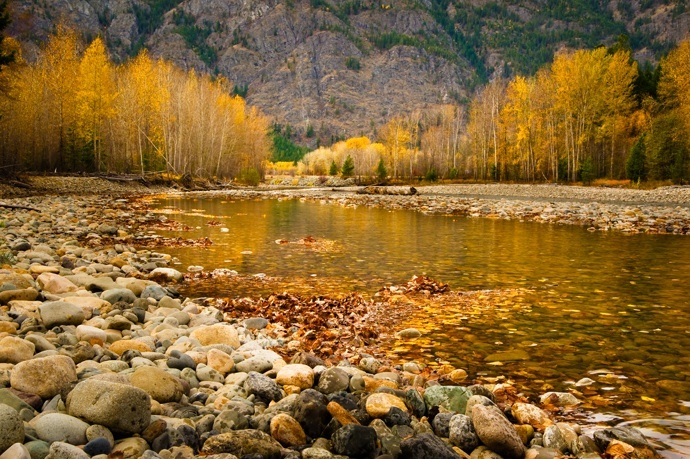 The 2007 Move to the Methow Valley. In 2005, Patrick and Kathryn decided it was time to leave the city and move to a place where they could be a part of a small community, enjoy four seasons, and spend quality time outdoors with their dogs. They purchased property in the Methow Valley, built a house and, in 2007, moved east of the mountains to Winthrop. In late 2007, Patrick and Kathryn opened Rover’s Ranch Dog Boarding. 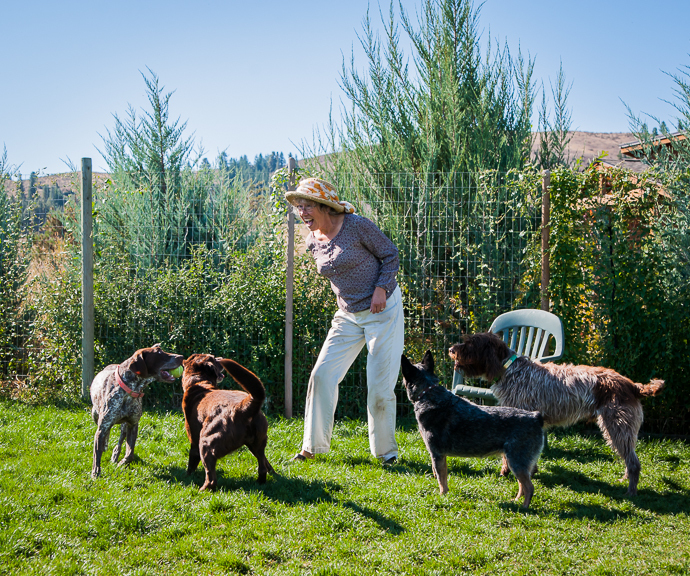 Since moving to the Methow Valley, Patrick and Kathryn have continued sharing their lives with a number of dogs, both beloved pets and kennel guests. You’ll frequently spot Patrick and Kathryn out on the trails with their own dogs. Kathryn and Cassidy, their Australian Shepherd, have been enjoying learning and running in the sport of dog agility. When we settled into our new home in the Methow Valley, we decided to transform what would have been our daylight basement garage into a centrally heated and air conditioned dog boarding facility. We operated this original kennel until the summer of 2012, at which time, we worked with our original home designer and builder to construct a new dog boarding facility based on all we had learned and experienced in the previous years. 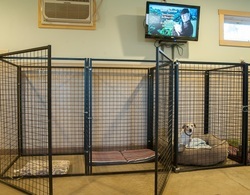 Our new facility offers secure indoor kennels with a common indoor play area. The dogs rest, eat and sleep in their own kennels. We outfitted the kennel building with a HEPA air filtration system, air conditioning and central heat so the dogs can enjoy fresh warm air in winter and cool air in summer. We also installed a flat screen T.V. on the wall facing most of the kennels so the kennel guests could feel more at home. Many of the dogs seem to enjoy this feature. We believe that mentally and physically active dogs are happy dogs. All kennel guests are let out into our large fenced-in play area at least six times a day. Here they can relieve themselves, run, chase a ball or a butterfly, seasonally roll in the snow, sniff, romp and play under our supervision. Some dogs especially love just lying down in the grass and watching the clouds drift by. The outdoor play times give each dog ample exercise and the opportunity to socialize with other guests or to get lots of one-on-one time with us. Belly-rubs are high on most dogs’ list. Please feel free to call and talk with us about the socialization benefits of boarding your dog at Rover’s Ranch. Also, please contact us if you would like to come see Rover’s Ranch. You can reach us at 509-341-4120 or by email roversranch@centurylink.net.